Take your small group or church deeper into Luke 15 than ever before. The parable of the prodigal son is about rebellion, repentance, and unfathomable grace. With this study, experienced and new group leaders alike will be equipped to lead a life-changing study for their group members. This study is like having Dr. John MacArthur personally lead your congregation or small group in a study on the best known parable in the Gospels! With "The Prodigal Son" DVD and discussion guide (included), you will have six lessons to share with your small group: The Parable, The Prodigal, The Father, The Brother, and The Murder. This is a repackaging of the study kit formerly titled ""A Tale of Two Sons"." - Publisher :Take your small group or church deeper into Luke 15 than ever before. The parable of the prodigal son is about rebellion, repentance, and unfathomable grace. With this study, experienced and new group leaders alike will be equipped to lead a life-changing study for their group members. This study is like having Dr. John MacArthur personally lead your congregation or small group in a study on the best known parable in the Gospels! With The Prodigal Son DVD and discussion guide (included), you will have five lessons to share with your small group: Parables, Forgiveness, Repentance, Pretense, and Grace. This is a repackaging of the study kit formerly titled A Tale of Two Sons. 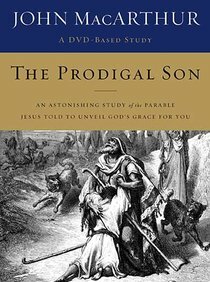 About "Prodigal Son (Dvd-based Stuy Guide)"
:Take your small group or church deeper into Luke 15 than ever before. The parable of the prodigal son is about rebellion, repentance, and unfathomable grace. With this study, experienced and new group leaders alike will be equipped to lead a life-changing study for their group members.